October 31, 1983: Ronald Reagan was president, and morning in America was still a far ways away: the unemployment rate was near 10 percent for the second year in a row. Ten days earlier, the Beirut barracks bombing, which killed 299 American and French troops, had occurred; and we’d just invaded Grenada in what was seen by some as a cynical misdirection ploy and others as justified and heroic. Movies released that month included Never Cry Wolf, Never Say Never Again, The Dead Zone and The Right Stuff. The No. 1 song was “Islands in the Stream,” a pop confection written by the Brothers Gibb and sung by Dolly Parton and Kenny Rogers. The best-selling novel, according to the New York Times, was James A. Michener’s Poland; and the best-selling nonfiction book was Erma Bombeck’s Motherhood: The Second Oldest Profession. I’d mention TV but, honestly, it was pitiful, as this schedule shows. I was 18, a college freshman, living at home and working as an usher at a movie theater. That last fact put money in my pocket, which gave me a modicum of freedom – as much as $3.35/hour could buy, at any rate. 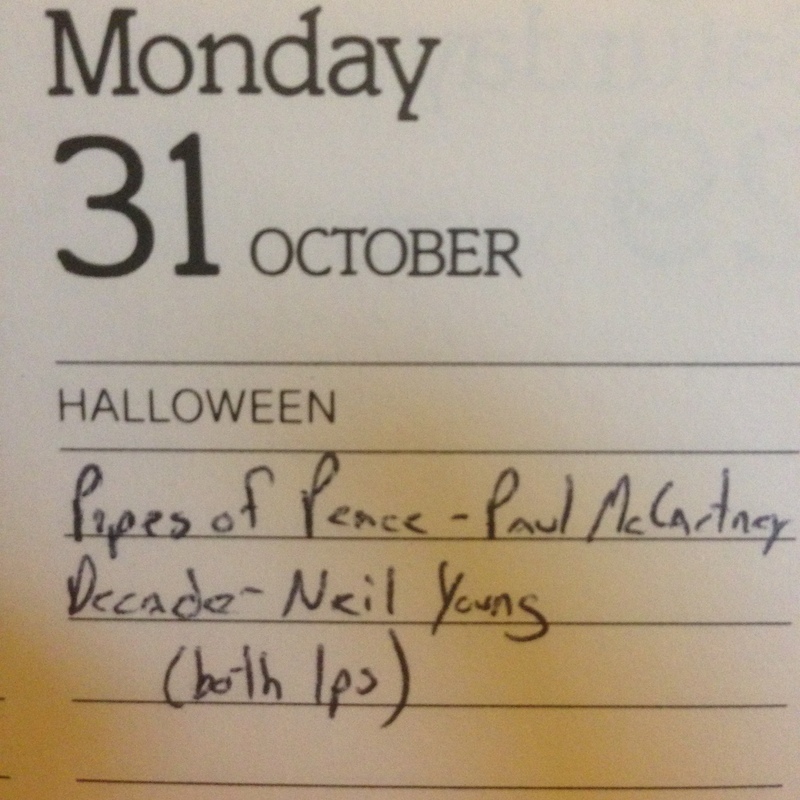 I’d used some of that freedom to see the Muddy Blahs (aka Moody Blues) in concert 10 days earlier; and, on this day, I exercised more of it with two purchases: Paul McCartney’s new Pipes of Peace and Neil Young’s new-to-me Decade, a three-LP compilation of his career through 1977. For today’s Top 5: Music I Bought in October 1983. 1) Paul McCartney – “Through Our Love.” Pipes of Peace was reissued yesterday, alongside its companion album, Tug of War; and I listened to it last night for the first time in near-32 years. It’s safe to say that it’s not his best outing, but it’s also not his worst – basically a mix of leftovers from the Tug of War sessions, one piece of pure pop gloss (the MJ duet of “Say, Say, Say”) and three wondrous works: the title track, breezy “So Bad” and this, which features a tremendous melody and lyrical message. Love, in both the abstract and specific, is indeed the answer for most of life’s ills. 2) Buffalo Springfield – “Mr. Soul.” I’d gotten into Neil Young’s music just two years earlier, with the release of re*ac*tor in 1981, so was playing catchup; Decade, which is one of the best anthologies released by a still-vital artist, was a great addition. The Buffalo Springfield songs, which I’d never before heard, were a revelation; and, in two weeks time, I purchased their one-LP Retrospective. 3) Irene Cara – “Fame.” True story: a year or so ago, Diane and I tuned in the 1980 movie Fame and the songs were silent – lips moved, but we couldn’t hear what they were singing or the music, period. Yet, we kept watching, and, even without the music, the movie worked – a little long, and very much of its time, but entertaining. Anyway, to the point: I have no idea why I waited until 1983 to pick up the 45 of the movie’s theme, but I did. Perhaps I’d recently caught it on Prism, a popular premium channel in the Philly area at the time, I don’t know. But this video is interesting and fun. It was filmed in 1982, likely to cash in on the MTV craze, and mixes footage from the film with shots of Cara lip-syncing to the song on the streets of New York. 4) Sly & the Family Stone – “Everybody Is a Star.” By rights, I should be including “Little Red Corvette” from Prince’s classic 1999 here, as I bought it on cassette on the 18th, but the Purple One removed his music from YouTube a while back, so I’ll instead go with something from Sly’s Greatest Hits, originally released in 1970, which I picked up on the 15th. 5) Pat Benatar – “Love Is a Battlefield.” It’s an odd thing, music fandom. I’ve stuck with some artists (Paul and Neil, for instance) since discovering them; others, however, I’ve relegated to my personal nostalgia circuit. One example: Pat Benatar. I doubt it had much to do with her music, per se, as this single – which enjoyed a five-week run atop the pop charts – is quite good, and expands upon her stylistic motif. I.e., she wasn’t repeating herself. But it was the last single or album of hers I purchased, save for her one-CD Best Shots compilation a decade-plus later. One possible reason: this video.